Dar Lighting Bey large single light ceiling pendant in a bronze finish. Mounted on a circular ceiling plate with a braided cable holding the luxurious gloss chocolate bronze shade, this magnificent metal pendant with its polished chrome inner which reflects the light beautifully, will be a perfect choice of lighting in any modern contemporary space. This fitting is height adjustable prior to installation and is double insulated. This product code is BEY0163. 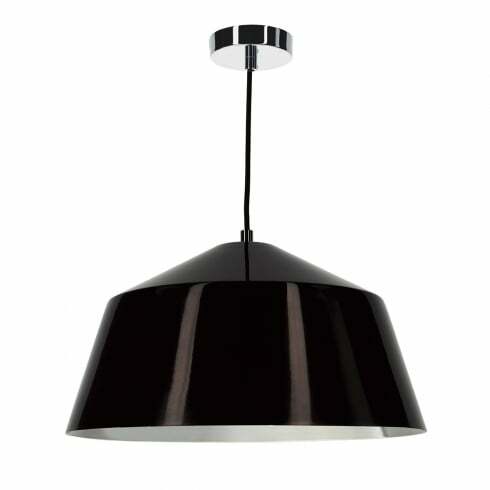 Dar offer an array of stylish ceiling pendants all of which can be viewed and purchased from our website.